Research In Motion introduces new aksesoris for tablet BlackBerry PlayBook, that is Mini Keyboard. 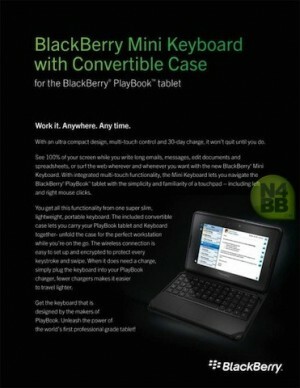 PlayBook Mini Keyboard has keyboard cover conclusion this laptop, right touch screen and click this a mouse. Mini keyboard is device portabel multifungtion, that is as boom that tablet can stand up. Besides Mini Keyboard equiped with addition battery, what gives 30 days power addition. With thick less than 6 milimeter, Playbook Mini Keyboard category admission ultraportabel and light. connecty to Playbook applies Bluetooth. Mini keyboard is supported fitur encryption 128-bit saving data to passing between keyboards and tablet safely. This device can work with BlackBerry PlayBook 2.0 Messages, the application contact and calender, Documents To Go, what gives experience of optimal user for the application of third party as Citrix Receiver, what enables user can access long distance desktop Windows and application from tablet. Clear that step taken by RIM is considered to be a way to assist sale PlayBook.